One day, an expert in time management was speaking to a group of business students and, to drive home a point, used an illustration those students will never forget. As he stood in front of the group of high-powered overachiever s he said, "Okay, time for a quiz" and he pulled out a one-gallon, wide-mouth mason jar and set it on the table in front of him. He also produced about a dozen fist-sized rocks and carefully placed them, one at a time, into the jar. 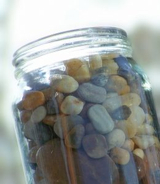 When the jar was filled to the top and no more rocks would fit inside, he asked, "Is this jar full?" Everyone in the class yelled, "Yes." The time management expert replied, "Really?" He reached under the table and pulled out a bucket of gravel. He dumped some gravel in and shook the jar causing pieces of gravel to work themselves down into the spaces between the big rocks. He then asked the group once more, "Is the jar full?" One eager beaver raised his hand and said, "The point is, no matter how full your schedule is, if you try really hard you can always fit some more things in it!" "No," the speaker replied, "that's not the point. The truth this illustration teaches us is: If you don't put the big rocks in first, you'll never get them in at all." What are the 'big rocks' in your life? The 'big rocks' are time with your loved ones, your faith, your education, your dreams, a worthy cause, teaching or mentoring others; the most important things in your life, they come first. Remember to consider these BIG ROCKS in your life first or you'll never get the rest of them in at all. If you leave the most important things in your life to the last, they won't fit into the jar at all!! So, tonight, or in the morning, when you are reflecting on this short story, ask yourself this question: What are the 'big rocks' in MY life? Then, put those in your jar first.